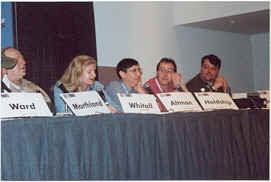 Getting nine former staffers from Creem magazine on a panel and not having to call 911 was a feat in itself, but it provided some of the liveliest 75 minutes of the conference. The Detroit-based rock magazine thrived during the Seventies and Eighties, but fell victim to a variety of ailments that shut it down at the end, including the high cost of publishing. 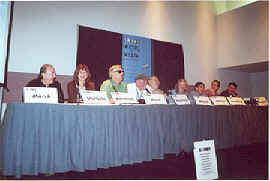 Dave Marsh, Jaan Uhelzski, Ben Edmonds, Ed Ward, John Morthland, Susan Whithall, Billy Altman, Bill Holdship, and moderator Jim Derogatis waxed rhapsodic, squabbled, squawked, and otherwise took joy in reminiscing about the publication's heyday. 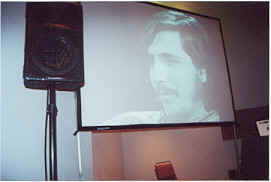 Opening with a short film clip of Creem staffers back in the early Seventies featuring "the president of the Stooges Fan Club," Lester Bangs, the generation gap between the staffers of the early days and those who were there at the end made for fascinating insight, intelligent discourse, and occasional laughs. Noting the not-coincidental relationship with Detroit's strong music scene, "We were part of the guitar army," opined Dave Marsh. "It was a lifestyle, not a job," Detroit News critic Susan Whithall agreed. 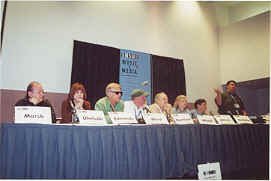 Edmonds, now U.S. editor of MOJO, concurred, but said that "apart from a passion for music, [the writers] had nothing in common." Still, Jim Derogatis' description of walking into the empty Creem offices for the first time and finding publisher Barry Kramer dancing alone to the Kinks was as much an affirmation of the spirit of rock criticism as it was a tender and personal memory. "When we saw something that scared us, we moved toward it," stated Dave Marsh, echoing Creem's fearless attitude in the then-new frontier of rock journalism, giving the world terms like "heavy metal" and "punk." Not all the audience was as warm and fuzzy, as a younger writer accused the nine of complacency, asking if they were given $40 million, would they do it again? Well, son, the former are in their 40s and 50s now, and setting the world on fire is less important than mortgage payments, but that doesn't mean music doesn't matter. It just means, as Marsh said, "Creem was an outsider magazine. You don't start outsider magazines on $40 million."